Google Fiber has changed its terms of service and now allows servers for non-commercial use. On Oct 5, 2013, after attempting to sign up for Google Fiber, I read the terms of service and refused because of a "no servers" clause. I bought some signs, and stood outside the convention center where they were holding early sign ups. After speaking with the people inside on Monday, I did not protest on Oct 7 while awaiting an answer on the server issue. 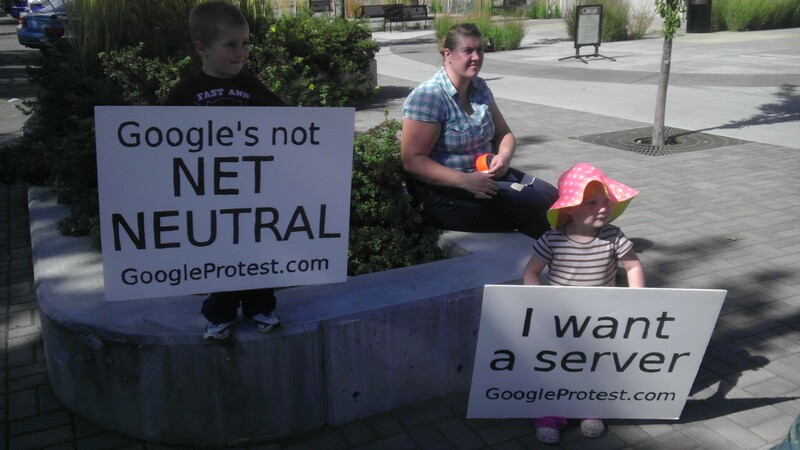 On Oct 8 2013 after getting no answer on servers again, I was back with my family holding signs. FenleyPics.com - Pictures of my family. DeepLandlord.com - A blog about being a landlord in Utah. John2016.com - My political campaign headquarters. Pontifier.com - My personal blog. RetCoin.com - A site for a new virtual currency I am creating. JADepoch.com - A site I made for a friend's birthday. GoogleProtest.com - A site I regsitered Oct 5, because I was so mad. Note if you will, that I don't have to have ads everywhere on these pages. I control the server, I control the content.